Meanwhile, in a large skillet over medium high heat, combine chicken, wine and seasoning, and bring to a boil. Cover, reduce heat to medium low and simmer for about 15 minutes, or until chicken is cooked through. Remove chicken from skillet, slice diagonally and return to skillet. Stir in Pasta Sauce and peas, and simmer for 5 to 6 minutes, or until heated through. Serve hot with cooked pasta. If preferred, substitute dry white wine with water or chicken broth. 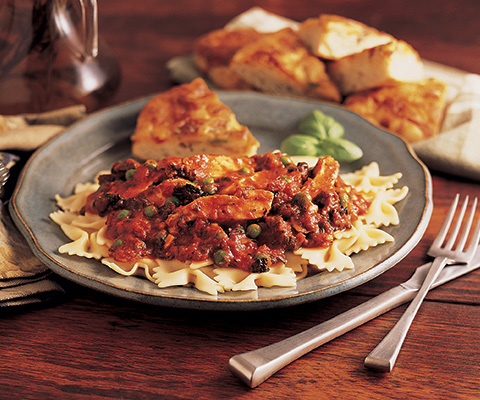 TIP: If desired, substitute Classico® Triple Mushroom Pasta Sauce with Classico® Traditional Sweet Basil Pasta Sauce.